Dridas Salvani is a Dunmer scout and Lawman of House Hlaalu located in Arenim Manor. He offers medium training in Long Blade, Athletics, and Block. As a scout he is also quite knowledgeable regarding regions, places and artifacts. 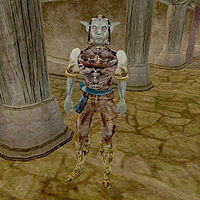 Dridas wears a dreugh cuirass, bonemold boots, and a common shirt with matching pants. He also carries shoes and a silver longsword. Aside from his natural resistance to fire and the sanctuary provided by his ancestors, he knows no spells.